A yatra is annually held to the famous Pandavleni caves near Nashik in Shravan month (July – August). It must be noted here that the Pandavleni Caves is not associated with the Pandavas. An annual religious yatra is observed after the Narli Purnima day. 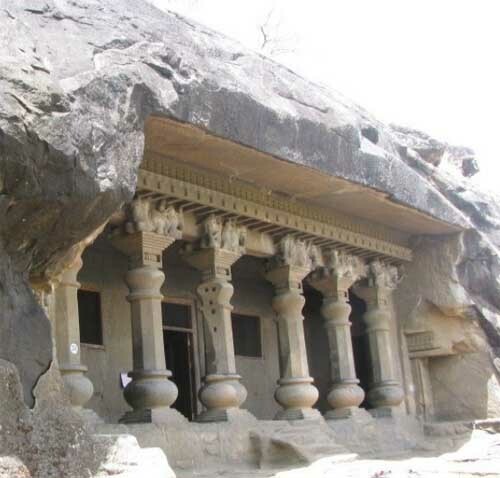 The Pandavleni Caves are located off the Mumbai – Nashik Freeway and it is in the Buddha Vihar Complex on the right side of the Freeway, 3 km before reaching Pathardi Phata, and 8 km before Nashik city. The caves are Buddhist Viharas. Leni in Marathi means ‘Cave.’ Pundru in pali language means ‘yellow ochre color’. There are 24 caves cut into the hillside with carvings of Buddha and various Buddhist monks. The biggest caves are 3, 8, 10, and 23. The interior of the caves have simple carvings whereas the exteriors are more elaborately and intricately carved. You need to climb 100 steps to reach the caves. And from the top, one can get a great view of Nashik city. The caves are deep and extremely cool during the morning and evening hours. There are no facilities in and around the caves. Those with knee problems should avoid the steep climb.